For other uses, see Cockerham (disambiguation). Cockerham is a small village and civil parish within the City of Lancaster in Lancashire, England. 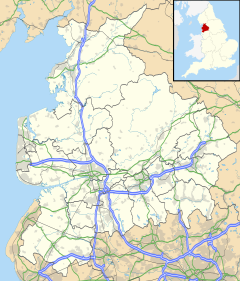 It is 6 miles (9.7 km) south of Lancaster and 15 miles (24 km) north-northwest of Preston. Located on the River Cocker, at the estuary of the River Lune, it has a total resident population of 558, increasing to 671 at the 2011 Census. Cockerham has lain within the historic county boundaries of Lancashire since the Middle Ages having previously formed a township and parish within the hundred of Lonsdale and district of Lancaster. Between 1894 and 1974, Cockerham lay within the Lancaster Rural District. The name of Lathwaite Farm, one of several old farms in the area, has Viking roots: lath meaning "farm" and waite meaning "barn". Medieval life of Cockerham manor has been recorded in the Custumal of the Manor of Cockerham, compiled in 1326–1327 and revised in 1463. The custumal, a record of rents and services owed by the tenants to their landlord, combines a local code of laws with an inventory of all resources of the land, from peat fuel, cattle and sheep to shoreline mussels. The tenants were forbidden to trade local fuel to the "strangers" who collected mussels on the shore. The local church is St. Michael's. The original parish church was in the middle of the village but was resited on higher ground due to frequent flooding. Close by are the remains of Cockersand Abbey. The village has a pub, the Manor Inn, though there have been at least two in the past. ^ United Kingdom Census 2001. "Cockerham CP (Parish)". neighbourhood.statistics.gov.uk. Retrieved 13 June 2007. ^ "Parish population 2015". Retrieved 7 June 2015. ^ "A Vision of Cockerham AP/CP". Lancaster RD Local Government District. Retrieved 14 May 2010. ^ Lancaster RD Local Government District. "A Vision of Lancaster RD". Retrieved 13 June 2007. Bailey, Mark (2002). The English Manor, c. 1200-1500. Manchester medieval sources series. Manchester University Press. ISBN 0-7190-5229-7. Wikimedia Commons has media related to Cockerham. Cockerham Parish Council, Official website. This page was last edited on 6 November 2018, at 02:28 (UTC).